Gleneagles, the world-famous Scottish hotel and sporting estate, has marked the beginning of a centenary year for its Top 100 ranked King’s and Queen’s golf courses by revealing a new celebratory logo that will be used throughout 2019. The branding, inspired by historic typography and graphics taken from the Gleneagles archive, celebrates the rich heritage and preservation of both James Braid-designed golf courses that opened for play in 1919. Both courses, The Queen’s initially opening as a nine-hole design, have become iconic destinations for golf lovers, connoisseurs and sporting celebrities the world over, and have benefited from extensive restoration projects that started in 2016. The important work took inspiration from archived photographs and Braid’s original designs and saw fairways widened, bunkers sympathetically restored, and the re-introduction of Scottish heather to better frame all playing surfaces. The King’s Course, that hosted the first informal Ryder Cup match between Great Britain and the USA in 1921 - the GB team included James Braid - and The Queen’s Course, one of the finest par 68 layouts in the UK, now accurately reflect an experience golfers visiting the Perthshire estate in the 1920s would expect. Recognising the successful completion of the renovation work, its golf courses have gone on to win a host of important accolades, underlining the significant progress the 850-acre estate has made since hosting The Ryder Cup in 2014. - Best Golf Experience, Scottish Golf Tourism Awards, 2017. Along with its hosting of The Solheim Cup in September on its PGA Centenary Course, designed by Jack Nicklaus, Gleneagles has a programme of celebratory events planned to mark 100 years of golf. These include soon-to-be-announced events for members, visiting golfers and hotel guests. Gleneagles also plans to mark the special occasion during the week of The Solheim Cup, Sept 9-15, and across the week of its International Pro-Am Tournament, which is staged July 23-26, directly after The Open at Royal Portrush, Northern Ireland. The International Pro Am is a unique tournament, affording guests an outstanding sporting challenge across The King’s, The Queen’s and The PGA Centenary courses, and blending exceptional golf with luxury accommodation and some of Scotland’s finest food and beverage experiences. 1 – The iconic James Braid designed King’s Course at Gleneagles. 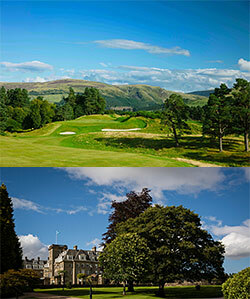 2 – The Gleneagles Hotel continues to welcome golf guests from across the world. An iconic country estate set beneath the beautiful Ochil Hills, The Gleneagles Hotel has been a luxury destination for nearly a century. Located just one hour from Glasgow and Edinburgh airports and with its own railway station, Gleneagles offers the perfect retreat for those looking for relaxation, fun and adventure. Three championship courses have established Gleneagles’ reputation as a golfer’s paradise but the hotel offers so much more than golf. The 850-acre estate epitomises the natural beauty for which Scotland is famed and offers guests a glorious playground of country pursuits and activities.